The two major soil fertility constraints of the West African savannah and in the subhumid and semi-arid regions of SSA are low inherent nutrient reserve and rapid acidification under continuous cultivation as a consequence of low buffering or cation exchange capacity (Jones and Wild, 1975). Generally, these constraints are tackled by applying chemical fertilizers and lime. However, the application of inorganic fertilizers on depleted soils often fails to provide the expected benefits. This is basically because of low organic matter and low biological activity in the soil. The chemical and nutritional benefits of organic matter are related to the cycling of plant nutrients and the ability of the soil to supply nutrients for plant growth. Organic matter retains plant nutrients and prevents them leaching to deeper soil layers. Microorganisms are responsible for the mineralization and immobilization of N, P and S through the decomposition of organic matter (Duxbury, Smith and Doran, 1989). Thus, they contribute to the gradual and continuous liberation of plant nutrients. Available nutrients that are not taken up by the plants are retained by soil organisms. In organic-matter depleted soils, these nutrients would be lost from the system through leaching and runoff. Weak acids, such as the organic acids in humus, do not relinquish their hydrogen (H) easily. H is part of the humus carboxyl (-COOH) under acidic conditions. When a soil is limed and the acidity decreases, there is a greater tendency for the H+ to be removed from humic acids and to react with hydroxyl (OH-) to form water. The carboxyl groups on the humus develop negative charge as the positively charged H is removed. When the pH of a soil is increased, the release of H from carboxyl groups helps to buffer the increase in pH and at the same time creates the CEC (negative charge). With an increase in organic matter, the soil recovers its natural buffer capacity; this means an increase in pH in acid soils (Figure 19). Note: Original pH level was 5.3. CEC is linked closely to the organic matter content of the soil. It increases gradually with time where organic residues are retained, first in the topsoil and later also at greater depth. Crovetto (1997) reported an increase in CEC of 136 percent (from 11 to 26 meq/100 g of soil) as a consequence of humus increase in the topsoil after 20 years of residue retention. To overcome acidity, lime is usually incorporated in the soil. 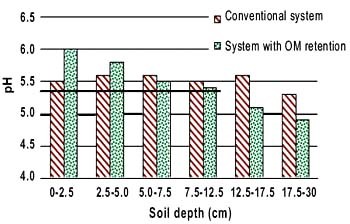 However, organic matter on the soil surface favours the transport of calcium carbonate (lime) to deeper soil layers after surface application (Table 6). The crop residues release organic acids that cause the lime to penetrate deeper into the profile much more rapidly than when applied on bare soil. Thus, it is no longer necessary to mix lime intensively into the soil, which is appropriate for farming systems based on reduced or zero tillage. Chapter 5 examined the water storage capacity of soils under improved organic management. However, in case of waterlogging, organic matter plays also an important role. The bioturbating activity of the macrofauna leaves various so-called conducting macropores in the soil, which are responsible for the drainage of water to deeper soil layers. Chan et al. 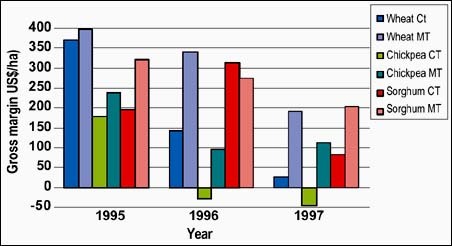 (2003) found a significant reduction in waterlogging after three years under no tillage compared with conventional tillage. The reduction was related to higher density of conducting macropores (140/m2 and 5/m2 for no tillage and conventional tillage, respectively), which was associated with higher population density of earthworms (240/m2 and 36/m2 for no tillage and conventional tillage, respectively). Plate 24 provide a demonstrationof this effect. Agronomic practices that influence nutrient cycling, especially mineralization and immobilization, result in an immediate productivity gain or loss, which is reflected in the economics of the agricultural system. Crop yields in systems with high soil organic matter content are less variable than those in soil that are low in organic matter. This is because of the stabilizing effects of favourable conditions of soil properties and microclimate. Improvements in crop growth and vigour stem from direct and indirect effects. Direct effects stem from improvements in nutrient and water content, as described above (also Box 8). Indirect effects stem from a favourable rooting environment and possible weed suppression and a reduction in pests and diseases. Does improved organic matter management pay? However, when using water-use efficiency (WUE) as means of comparing outputs across farming systems, the results are even more drastic. In this case, rather than the common method of determining WUE by breaking the season into fallow and in-crop components, a total water-use efficiency factor was used. Both grain yield and gross margin are divided by total water to obtain an insight into how well farmers managed the conversion of water into yield and money in the year 1997. Source: Rummery and Coleman, 1999. Immobilization of N may occur in systems with crop residue management, especially where C:N ratios of the residues are high (tough, woody materials). This can cause a decrease in maize yield. Figure 20 shows the effect of tillage and the preservation of crop residues on maize yield. The preservation of wheat and horse-radish residues on the soil surface led to immobilization of N, which was overcome through the application of N fertilizer. Based on these data, maize with oats, lupine and vetch as a winter cover crop (without fertilization) can produce a yield that is comparable with or higher than those obtained with conventional tillage and a fertilizer treatment of 90 kg/ha. 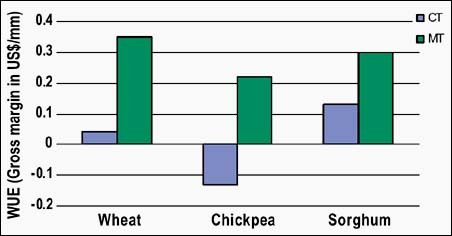 In this case, the yield increase was highly correlated with the P content of the leaves and the P availability in the soil. This occurred because of the higher moisture content in the soil under the mulch layer, which led to a higher P uptake by plant roots. Grain crops can also have residual effects on each other through the decomposition of chemical compounds in the residues. Some people are concerned that intensified systems with reduced or zero tillage will increase herbicide use and in turn lead to increased contamination of water by herbicides. 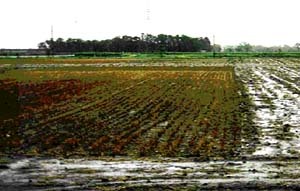 According to Fawcett (1997), total herbicide use in the United States of America declined during the period of adoption of no-tillage systems. He concludes that herbicides are important, but that farmers using conventional tillage methods use similar amounts of herbicides to no-tillage farmers. In Honduras, a strong decline in the use of herbicides has been observed (Figure 21). 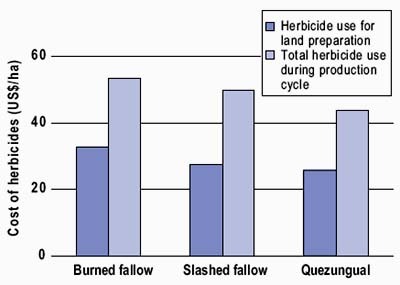 Farmers who no longer burn their fields prior to preparation spend less money on herbicides. Farmers who have adopted the Quezungual system spend less on herbicides and make savings, both in terms of land preparation and total costs. It is becoming evident that the need for herbicide use diminishes over time in wellmanaged no-tillage cropping systems. The principal reason is that the system reduces the existing seed bank in the soil by the synergy of two activities: reduction of the production of new seeds through avoidance of flowering and fruit setting; and reduction of seeds that are brought to the surface by tillage practices. perennial weeds are no longer redistributed by equipment. The result is that the soil weed seed store diminishes in time and, consequently, the weed problem also diminishes, as does the need to use herbicides. The concentration of soil organic matter in the topsoil layer plays an important role in the absorption of herbicides. When the concentration of organic matter in the topsoil decreases, contamination of the environment by herbicides is likely to increase. Enhanced levels of organic matter cause enhanced adsorption of pesticides, followed by gradual degradation. Herbicides, like other pesticides, can be used by micro-organisms as a substrate to feed on (Haney, Senseman and Hons, 2002). Herbicides are broken down in soil and water by micro-organisms into natural acids, NH4-, amino acids, carbohydrates, phosphate and CO2 (Schuette, 1998). As microbes cause more rapid degradation of pesticides, enhancing microbial activity may reduce leaching of pesticides. Many herbicides, including glyphosate and paraquat, which are the most common herbicides used in reduced-tillage systems, are bound tightly to clay and organic matter by electrostatic forces and hydrogen bonding. Once they are bound to soil organic matter, the herbicides become inactive and no longer affect plants. Moreover, they can form insoluble complexes with metals in the soils. This also contributes to their rare stability in the soil and low potential for leaching into groundwaters (Ahrens, 1994a, 1994b). Some studies have shown that there is no reason to believe that glyphosate may cause any unexpected damage to the environment (Torstenson, 1985). However, other studies illustrate negative effects on soil life or its functions. Farming systems that increase soil organic matter content (e.g. no tillage) reduce the probability of environmental contamination by herbicides. Conventional agriculture tends to reduce aboveground and belowground diversity. Thus, it brings about significant changes in the vegetation structure, cover and landscape. The change in vegetal cover during the conversion of forest and pastures to cropping affects plants, animals and micro-organisms. Through increasing specialization of certain plant species (food and fibre crops, pasture and fodder crops, and tree crops) and livestock species, some functions may be affected severely, e.g. nutrient cycling and biological control. Some non-harvested or associated species profit from the change and become pests. However, many organisms either disappear completely or their numbers are reduced drastically, e.g. pollinators and beneficial predators, unless efforts are made to retain a suitable habitat (Box 9). Associated species can be managed to a certain extent. Through appropriate crop rotations, crop-livestock interactions and the conservation of soil cover, a habitat can be created for a number of species that feed on pests. This will in turn attract more insects, birds and other animals. Thus, rotations and associations of crops and cover crops as well as hedgerows and field borders promote biodiversity and ecological functions. Because of the complexity and richness of soil biodiversity, the effects of crop and pasture management are less well understood. However, the effects on certain functional groups and, hence, specific soil functions are being recognized increasingly as vital for agricultural productivity and system sustainability. Before the transformation of native grasslands and forests into agricultural areas, a large number of species of scarab beetles and their larvae (white grubs) inhabitated the soils in southern Brazil. With the transformation of these areas, some of these beetles disappeared, while others became so well adapted and, lacking biological control agents, became important soil-dwelling pests. However, there are other species that can be considered as facultative pests. The larvae prefer feeding on surface litter or surface deposited animal excrements, but may become pests when not enough surface litter is present for them to feed on, like the genera Diloboderus and Bothynus. The large beetles create large, permanent galleries (holes) in the soil, down to a depth of more than 1 m, in which they spend most of their lives. The holes may serve as preferential pathways for water infiltration and root growth, and the chambers become niches of increased soil fertility. Both chambers and galleries provide temporary and permanent refuge for many other soil-dwelling invertebrates and microfauna. Research revealed that beetle grub holes were more abundant under no tillage (NT) (8.8-9.6 holes/ m2) than conventional tillage (CT) (0.7-1.3 holes/m2). The largest and deepest holes were also found in NT (up to 33.5 mm in diameter and 117 cm deep). Consequently, the total volume of pores opened in NT (450-503 cm3) was up to almost 10 times greater than in CT (53-107 cm3). Source: Brown et al., 2003. Soil has the ability to restore its life-support processes provided that the disturbance is not too drastic and that sufficient time is allowed for such recovery. Organic matter and biodiversity of soil organisms are the driving factors in this restoration. Decreases in numbers and types of soil organisms and available substrate (organic matter) lead to a decrease in resilience, which in turn can result in a downward spiral of degradation. Resilience can be defined as the ability of a system to recover after disturbance (Elliot and Lynch, 1994). Soil resilience depends on a balance between restorative and degrading processes. Factors affecting resilience can be grouped in two categories: endogenous and exogenous. Endogenous factors are related to inherent soil properties (rooting depth, texture, structure, topography and drainage) and microclimate and mesoclimate. Exogenous factors include land use and farming system, technological innovations and input management (Lal, 1994). Hence, appropriate agricultural practices can influence these factors in order to enhance soil resilience. The preservation of aggregate stability is important in order to reduce surface sealing and increase water infiltration rates (Whitbread, Lefroy and Blair, 1998). With increased stability, surface runoff is reduced (Roth, 1985).